Sound designers and adventurous music producers will flip for Blackhole's versatile, hands-on features. Beautiful sound. Excellent real-time control. Good preset library. Non-sound designers may find it difficult to justify the price. 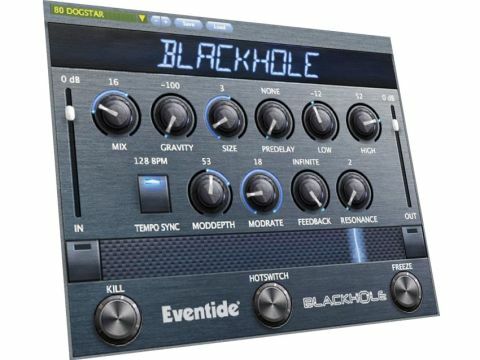 Originally an algorithm in Eventide's DSP4000 and H8000 Ultra-Harmonizer hardware processors, then their Space stompbox, and now a Mac/PC plug-in, Blackhole is a unique reverb designed to create massive 'alien' ambiences and sound design effects, as opposed to realistic spaces. "Blackhole's two secret weapons are the Hotswitch and Ribbon Controller, both of which enable switching between two complete control states"
The reverb tail is primarily defined by the Gravity, Size and Predelay controls. Gravity combines what other reverbs would call 'density' and 'time/ decay', dialling in forward reverb when turned clockwise past the midpoint, and inverse (reverse-style) anticlockwise. Size ranges from galactically huge to artificially tiny, while Predelay can be set up to two seconds long and synced to the host DAW's tempo. Low (350Hz) and high (2kHz) shelving filters are onboard, with a single Resonance knob boosting the corner frequencies of both. Further ear-bursting extremity is provided by the Feedback knob, which can be set to Infinite (stopping the incoming signal from escaping the feedback loop) and Freeze (same again, but killing the input, so that the reverb stays constant, although you have to turn the Mod Depth right down for this to truly 'freeze' the tail). The reverb tail can also be gently modulated with the Mod Rate and Depth controls. Finally, the Freeze button switches the Feedback to Infinite and Mod Depth to 0, and kills the input, while the Kill button mutes the input and lets the tail fade out. Reverb's not the kind of effect that generally lends itself to real-time tweaking, but Blackhole positively revels in it. The interplay between parameters is crazy. Set the Gravity and Size knobs up to create a (relatively) conventional reverb, and transform it into something utterly unreal with the Mod Rate, Mod Depth and Feedback knobs. Then push the Gravity into the inverse range or set a negative Size value to get even more bizarre results. Adjustments to the Size parameter in particular are beautifully smooth, enabling all manner of weird slow-down/speed-up effects, aggressive divebombs and energetic risers. The Feedback and Mod controls can be used to conjure up ring modulation and comb filtering-style effects, and the Low, High and Resonance controls deliver surprisingly flexible regular filtering. This tweak-friendliness is fully capitalised on by Blackhole's two secret weapons: the Hotswitch and Ribbon Controller, both of which enable switching between two complete control states. The 'B' state for the Hotswitch button is set up by holding it down 'til it flashes, then setting the knobs as desired - then simply click the button to jump instantly between the two states. For the Ribbon Controller, every knob has its own movement range, set via the (reversible) blue arc round each one - the left and right-hand ends of the Ribbon Controller (which can be assigned to a MIDI controller and host automated) correspond to the ends of the knob arcs, and shifting it left and right makes every knob move accordingly, morphing smoothly between two complete patches. The Ribbon Controller and responsive, broad-ranging parameters make Blackhole a true performance effect, and the sound is stunning, with all the magnificent Lexicon gloss and shine we know and love. The epic, evolving soundscapes, haunting drones and sinuous ambiences that it spits out have to be heard to be believed; and while the emphasis is on enormous, celestial voids and 'spaces', we actually got similar mileage out of it making much smaller, madder effects, too. In a word: cosmic.